Have you ever received the same gift twice? Those days are over with Joey the wishlist manager. Check out our Demo-Account to see how it works. Click on the button to sign in with your Facebook account. No Facebook? Just fill out this 3 fields and you are in. Joey will never share your email address or send you spam. Big koala promise. You signed up without Facebook? Login! "What a great idea! No more sending that second toaster to the op-shop"
"Signing up is really quick and easy… totally worth it. 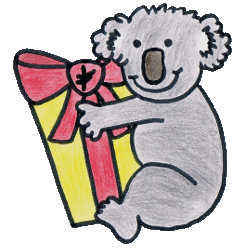 I love that I can share my link via Facebook seeing as I don’t really have all my friend’s email addresses"
"Wish Koala was the perfect solution for gift-giving and receiving. I told my whole family and all my friends about it and they loved it too"
"Awesome idea. Great and really easy to use"